Director – David F. Sandberg, Screenplay – Eric Heisserer, Based on the Short Film by David F. Sandberg, Producers – Lawrence Grey, Eric Heisserer & James Wan, Photography – Marc Spicer, Music – Benjamin Wallfisch, Visual Effects – Aaron Sims Company, Special Effects Supervisor – Mark Byers, Production Design – Jennifer Spence. Production Company – New Line Cinema/Atomic Monster/Ratpac-Dune Entertainment/Grey Matter Productions. Following the death of his father in mysterious circumstances, young Martin Wells becomes fearful of something that lurks in the shadows. His stepsister Rebecca is then called in by his school because Martin is sleeping during class. She finds that their mother Sophie has gone off her psychiatric meds and so makes the decision to take Martin to her place. There Rebecca sees the figure that lurks in the shadows too. However, social services insist on repatriating Martin with Sophie. Rebecca starts digging into her mother’s past concerning the time when she was placed in a psychiatric institution and befriended a girl named Diana who had a rare disorder that caused light to burn her skin. Rebecca and her boyfriend Bret move into her mother’s house where they determine to find what it is that has brought Diana back from death. 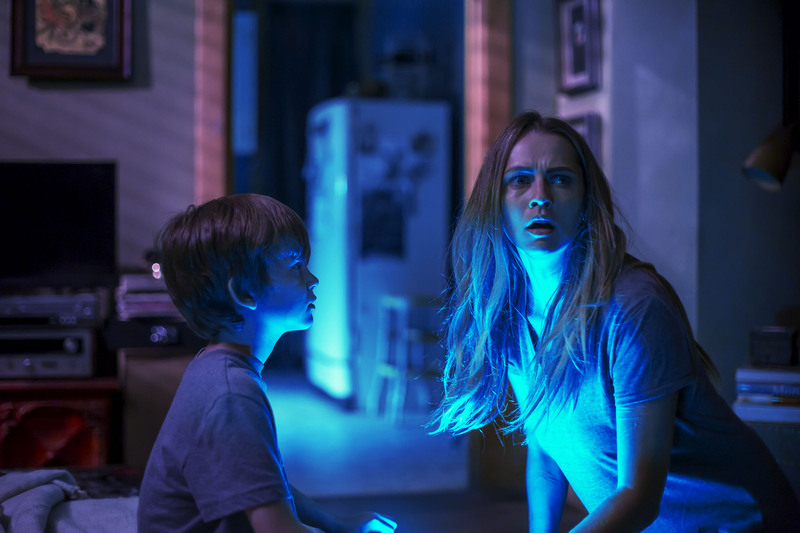 Lights Out – not to be confused with or related to the classic Arch Oboler horror radio series Lights Out (1934-47) – is a feature-length directorial debut for Swedish director David F. Sandberg. Sandberg had previously made the film as a three-minute short Lights Out (2013) starring Lotta Losten (who appears as Billy Burke’s assistant in the opening scenes here). This gained attention and was promoted by James Wan, director of high-profile horror films such as Saw (2004), Insidious (2010) and The Conjuring (2013), who acts as co-producer through his Atomic Monster production company. The script comes from Eric Heisserer who has specialised in writing genre scripts for other people’s material with the likes of A Nightmare on Elm Street (2010), Final Destination 5 (2011) and The Thing (2011), although he did subsequently write the script for Denis Villeneuve’s Arrival (2016) and Bird Box (2018). Lights Out feels exactly like one of the horror films made circa 2002 – I kept flashing back to works like They (2002) and Darkness Falls (2003) and their boogeymen (boogeypeople?) that lurk in the dark. The Diana creature reminded me of the much more sophisticated The Babadook (2014), or even the Crooked Man that turns up in James Wan’s own The Conjuring 2 (2016). Although perhaps more than any of these, I kept thinking of one of the Monkey Ghosts from Apichatpong Weerasthakul’s Uncle Boonmee Who Can Recall His Past Lives (2010). James Wan is an exemplary director when it comes to his own material but the string of films that come out under his producing name – Annabelle (2014), Demonic (2015) and The Nun (2018) – have left a good deal to be desired. The same can be said of Lights Out. It is not that David F. Sandberg fails to create a sufficiently scary film. The appearances of the ungainly Diana creature that only exists as a shadowy shape who is there when the lights are out but vanishes when they are on create a sense of uncanniness. There are definite times that Sandberg makes an audience jump or tense up in their seats. On the other hand, there is the feeling that David F. Sandberg is only doing things that have been done before. Lights Out is very much a film that trades in jumpshocks. Many of the jumps are annoyingly ones that come from just throwing a shrieking noise at an audience on the soundtrack. This gets a jolt out of the predominantly youth audience but the effect on a more jaded viewer like me was a sense of ennui at the same time as there was an admiration of the mild accomplishment of effect. The film could have been put together by a script robot. The characters in the film – the kid, Teresa Palmer who is intended to evoke just enough rock chick to seem mildly edgy and falls back to standard concerned heroine the rest of the time, her incredibly weedy hipster boyfriend Alexander DiPersia – are written with the absolute minimum of characterisation. Of all the interesting ways the characters could have been written, when the big argument in the film during their introduction scene is over DiPerisa trying to hide a sock in Teresa’s drawer, your anticipation of what is to follow sinks in a major way. The other frustrating thing is that it is never clear what it is that we are dealing with. The characters make the reasonable assumption that they are dealing with a ghost or something returned from the dead but Maria Bello (who admittedly is meant to be nuts) emphatically denies that what they are dealing with is dead. Some of the climactic scenes give you the impression that what they are dealing with is someone alive. On the other hand, when we come to the ridiculous climactic scene where [PLOT SPOILERS] Maria Bello despatches Diana by blowing her own brains out, you are left baffled. Are we supposed to accept that Diana was some type of projection from her mind? Or perhaps some entity that attached to her and her alone? As a denouement, it only leaves you confused. David F. Sandberg subsequently went on to direct the also James Wan-produced Annabelle: Creation (2017) and the DC Comics superhero film Shazam! (2019).